By Luis Carlos Montalván, with Bret Witter. Hyperion. $22.99. Unless one has served armed-forces duty in a war zone, you probably can’t grasp the residual effects these individuals bring home with them. Some we see — like burns, missing limbs and other injuries that leave them incapacitated. Psychological wounds aren’t always as visually apparent but are equally crippling. 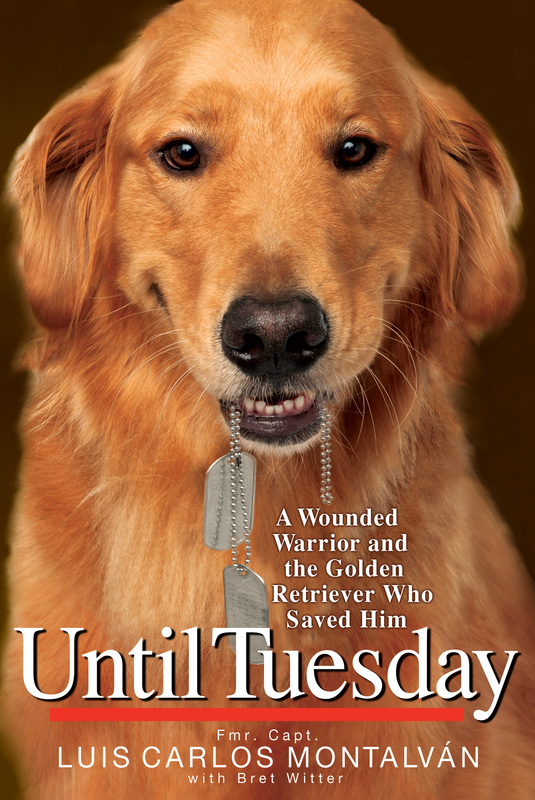 This stirring and revealing account details the latter and showcases how a golden retriever saves the life of this wounded warrior and how highly trained service dogs offer the same potential for thousands of other veterans returning from the Middle East. Montalván, a highly decorated captain in the U.S. Army, serves two tours of duty in Iraq, but after returning home from combat, a fractured vertebrae, torn-up knee, a brain injury and Post-Traumatic Stress Disorder take their toll, putting him on life’s fragile ledge and on a course to potential destruction. All that changes when he meets Tuesday, a service dog whose training has taken him into a prison and a home for troubled teens. One of four in his litter, Tuesday begins his two-year training mere days after birth under the direction of East Coast Assistance Dogs, a nonprofit in upstate New York that trains dogs for the disabled. Cost of training is $25,000, with payment made by anonymous donors. Montalván opens with a carefully crafted present-day chapter detailing the incredible bond between the pair, before taking the reader into battle in Iraq, where he leads a platoon into combat and trains Iraqi soldiers, police and border police, and dealing with his personal demons upon returning home following his second deployment. “Until Tuesday” breaks down barriers and details how each finds his lifetime soul mate. “Tuesday gave me freedom, even from my worst fears, and by doing so he gave me back my life,” emphasizes the author, who for months lives with a literal No Trespassing sign posted on his life. To tell Tuesday’s story, Montalván must tell his own, hence the reader finds himself/herself traveling between Iraq and New York City in this richly detalied narrative of true grit and psychological turbulence, ranging from an ever-changing war zone to fast-paced, metropolitan center. The end result is an unequivocal two-way trust and commitment that serves as an exhilarating reflection of hope and commitment.